10% of cars every year fail their MOT due to the brakes- the third highest reason for an MOT failure. Labeled a failure, some garages might prescribe a full set of new brakes, a fee which, on top of the MOT itself and labour costs, could set you back £250- £300! Get your Breaking Brakes fixed by getting quotes from us! Understanding the anatomy of your brakes and when they need changing can save you anything upwards of £200 on this failure and in this article we’re going to break down (if you can excuse the pun) the key components within your brakes, their individual cost and when you need to change them. And it’s so worth knowing! An occasional service of your brakes by yourself or a local, reputable garage we network at MyCarNeedsA.com can add years worth of life to your brakes and avoid the horrible, nasty shock which comes with the harsh MOT fee we all dread. Firstly, there are two types of brakes: drum brakes and disc brakes. Drum brakes are an older design than disc, which began to be phased out of installation in the front wheels in the 1970s. Cheaper to make and more durable but far less reliable and efficient, since the millennium it’s become commonplace to find cars which do not use them at all. In those that still do they are typically located in the rear wheels of your car, where only 10%-30% of the power applied to stop a vehicle is centred. It’s rare you’ll be quoted a new drum brake but if you do, it will range from £30-£75. 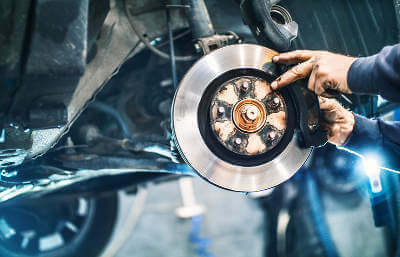 Disc brakes are the standard in modern braking, first introduced in motor racing, and as they bear the burden of your resistance they are almost always the brakes quoted as failing in an MOT. These brakes a fitted with two primary components: brake pads and the brake disc itself and either or both can fail in the MOT. By clamping the pads together when the brake pedal is pressed the resulting friction slows and eventually stops the rotation of the wheel. Over time or through excessively violent and abrupt use, the surface of the pads and/or disc will wear thin and need replacing. Crucially, with disc brakes the parts are far cheaper than the whole. Depending on the power of your engine, a set of brake pads can range from £40 per pop to £100 approximately, with a single pad as low as £20. Equally, with discs rates begin as low as £15 per disc to over £100 for luxury or specialised discs. For an entire set of pads and discs, as often quoted in your MOT, this can double, with a full set of pads and discs ranging anywhere between £100 to £250+. The critical part of this equation is that it’s rarely that your full brake needs replacing. When Does A Part Need Replacing? It’s all about thickness, as the components will naturally wear thin over time. For the pads, a guideline when measuring is consider replacing them as soon as they reach ¼ of an inch in width and if they’re closer to ⅛ th you should do it immediately. Squeaky brakes, ‘pulling’ or drifting and soft pedals are all signs the pads are failing. Equally, at this stage modern cars may offer an audible warning sound when your brake pads wear beyond 30% of their full width. For the disc, it’s far more variable as each and every disc differs in its size. You can find the minimum specified thickness in your manual and many suppliers also punch a stamp to the edge of the disc itself to inform you when it’s getting too low. Discs generally wear thin considerably less quickly than pads do, which is why it’s worth knowing your stuff. If a garage quotes a full brake replacement on a new car and that both disc and pads are too low, they could be exaggerating. For reference, according to 2CarPros.com, the recommended distance at which to get your brakes serviced is 20,000-40,000 miles. If you’re unsure about a quote you’ve received, always get a second opinion. Cost of labour varies DRASTICALLY from garage to garage, with some garages charging over double the hourly rate for service than others. As such, when you combine these factors together a job that could cost you as little as £40 can rack up fees over £200! If you have a friend who’s in the know with cars, it pays to invest in their time but if you’re like most and at a loss with mechanics, you can save massively by getting a honest, trustworthy quote for the right service. MyCarNeedsA.com networks hundreds of independent local garages and only with verified reviews and references. Before you commit to paying hundreds of pounds for a service that might require a fraction of the price, double check with a quote for your brakes online with us first.